Own a Piece of Japan: Elevate Your Lifestyle at The Seasons Residences - Federal Land, Inc. Own a Piece of Japan: Elevate Your Lifestyle at The Seasons Residences - Federal Land, Inc.
Japan is known to be a world leader in state-of-the-art technology and design that lean towards functionality and elegant simplicity. Despite their modern way of life, the Japanese’s reverence for their rich culture, architecture, and mother nature is just one of the many reasons why millions of people flock to the Land of the Rising Sun every year. Soon, people in the Philippines won’t have to travel to Japan to experience the Japanese way of life, because they can own a piece of Japan in the thriving metropolis of Bonifacio Global City. Federal Land, Inc., one of the country’s top real estate companies, has partnered with two of the biggest names in Japan’s prime real estate and retail industries – Nomura Real Estate Development and Isetan Mitsukoshi Holdings, Inc. – to bring a piece of Japan to Bonifacio Global City in Taguig – The Seasons Residences. The three corporate giants have expressed their delight in this partnership. “We look forward to our fruitful partnership with Nomura Real Estate and Isetan Mitsukoshi and we’re very excited to bring a piece of Japanese life to the Philippines. We know a lot of Filipinos and expatriates would love to get a Japanese experience within the comforts of their own home. The Seasons Residences is the first of its kind in the country where residents can live, shop, and dine the Japanese way,” shared Mr. Alfred V. Ty, Chairman of Federal Land, Inc.
“As a company, we look for equally strong partners in every project. We consider it an honor to bring the excellence that Nomura Real Estate is known for and to share it with the Philippines. We’re very happy to find a good partner in Federal Land Inc. so we can transform our vision of integrating all that is precious to people and communities into reality,” said Mr. Eiji Kutsukake, Chairman of Nomura Real Estate Development Co., Ltd.
“We know how much Filipinos love to go to the mall to shop and eat, or simply just to relax, so we hope Filipinos will enjoy their Mitsukoshi Mall experience. We are excited to open the first mall of its kind in the Philippines,” said Mr. Toshihiko Sugie, President and CEO of Isetan Mitsukoshi Holdings Ltd. 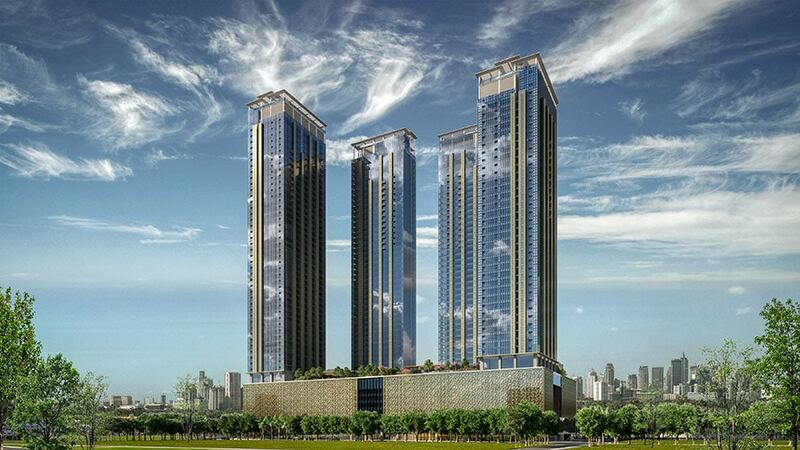 The Seasons Residences is a US $400-million joint venture among the three companies. It will be a mixed-use, integrated lifestyle center that will be home to four residential towers ranging from 41 to 51 levels. The over-all design will reflect the harmonious balance between Japanese technology, architecture, and Filipino hospitality. At the heart of The Seasons Residences is the very first Mitsukoshi Mall in the Philippines, offering a uniquely Japanese mall-going experience. The stores and restaurants at Mitsukoshi Mall will be carefully curated to reflect the brand’s dedication to providing the ultimate Japanese shopping experience. Mall-goers can expect a selection of Japanese homegrown brands, restaurants offering authentic Japanese fare, and well-known international brands. Mitsukoshi Mall will be home to Japanese brands that won’t be found anywhere else in the country. Mitsukoshi Mall is bringing its signature supermarket to elevate one’s grocery experience. Shoppers can expect a wide array of high-quality goods from Japan, which can be found in the supermarket’s own sweets shop, fresh items section, and premium food court. Mitsukoshi Mall will always have something for any kind of shopper — from those who are in search of the latest and premium beauty products, to those who are seeking entertainment and those who wish to have their fill of great food. Mitsukoshi Mall is set to be the ideal mall that one can go to everyday for unique shopping finds and gastronomic offers. “The residential towers of The Seasons Residences will focus on four key aspects: functionality, safety, harmony with the environment, and Japanese technology,” said Mr. Ty of Federal Land, Inc. The developers worked together to find the harmonious balance between Japanese elements and Filipino hospitality. This balance is reflected in the buildings’ architecture and design, as well as its amenities. Japanese technology and design principles were observed to convey the style, convenience, and eco-friendliness of Japanese living. Uniquely Japanese storage solutions, like kitchen floor cabinets and a spacious shoe rack, are installed in each unit to maximize every inch of usable space and to keep everything organized. At The Seasons Residences, innovative Japanese technology is optimized to ensure safety and security. The Seasons Residences is equipped with the most advanced technology to withstand strong winds and vibrations that may be caused by earthquakes and typhoons. All four towers incorporate a sophisticated damper system, a breakthrough in earthquake vibration control technology. The damper system is used in some of the tallest buildings and structures in the world, including the world’s longest suspension bridge, the Akashi Kaikyō Bridge in Japan. Indoor security features include a state-of-the-art keycard access system for the elevators and main doors. To address environmental concerns and conserve resources, eco-friendly solutions like energy-efficient lights and Japanese-branded ecological bathroom fixtures, are installed in every unit. The Seasons Residences is dedicated to bringing all these technologies to Filipinos seeking for a better way of living. Residents can even share this metropolitan sanctuary with friends and families with a unique feature, The Guest House. Located at the amenity deck, the Guest House features a Japanese-inspired tea room and a spacious bedroom, so guests can rest, relax, and experience the Japanese lifestyle for themselves. Channeling Japan’s deep respect for nature, the amenity floor of The Seasons Residences is designed after the four seasons: Haru (spring), Natsu (summer), Aki (autumn), and Fuyu (winter). Haru/Spring brings the season of activities, whether indoors or outdoors. This section of the amenity floor houses the gym with top-of-the-line equipment as well as a lush garden, which could either be a great place for a picnic with the whole family or some alone time to meditate and find your inner zen. Natsu/Summer means a refreshingly fun time at the pool. The Seasons Residences has a separate pool for kids and adults, ensuring safety and maximizing the fun. Only a few steps away are the karaoke station and game room for all forms of entertainment. Function rooms are also available for family reunions and get-togethers. Aki/Autumn encourages one’s creativity, so residents can make use of the well-appointed business center and the music studio to make sure they can channel their creative juices when inspiration hits. Fuyu/Winter is about staying at home and finding ways to soothe the mind and body. Residents can visit the dry garden to meditate and reflect, or spend some time in the spa to detoxify. There’s a reason why people love going to Japan. Whatever your reason may be, you’ll find it soon at The Seasons Residences. A prime real estate developer, Federal Land, Inc. is a member and one of GT Capital Holdings’ property arms. With 45 years of experience in reshaping the skyline and with its commitment to invest in the country, Federal Land, Inc. creates properties built on trust, reliability, and integrity through its masterbrands, Federal Land and Horizon Land. Nomura Real Estate Development Co., Ltd. is part of the Nomura Group of Companies with a history of more than 90 years of investment banking experience. One of the more prominent members of this Group is Nomura Securities, one of Japan’s largest financial institutions. The Real Estate Company engages in residential development, corporate real estate brokerage, commercial property development, building leasing, and architectural design businesses. It develops and sells condominiums, detached housing, and redevelopment projects mainly in the Tokyo metropolitan area. The residential development business provides quality residential accommodation under the PROUD and OHANA brands. The company was founded in 1957 and is based in Tokyo, Japan. Established in April 2008, the company is a Japan-based holding company mainly engaged in department store business. The Company has five business segments. The more popular ones are: The Department Store segment which is engaged in the operation of general department stores in Japan domestic markets and overseas markets. The other popular segment is The Retail and Special Store segment which is engaged in the sale of women’s clothing, the manufacture of food and the operation of super markets. They are best known for their Isetan – Mitsukoshi Department Stores, which can be found all over Japan, as well as in Europe and the United States. In Asia, they are already present in China, Singapore, Malaysia, Thailand and Taiwan. This is their first time to enter the Philippine market.